The Rhode Island flag came into use during the last quarter of the 19th century, but the design draws on a tradition that predates the United States of America. It is not the first flag of Rhode Island, but it does show a clear influence from the flags that were in use before it. 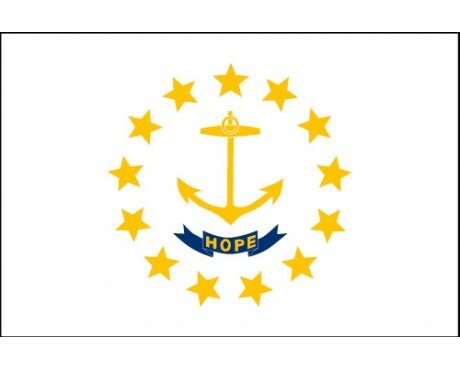 The Rhode Island state flag has a white field that features a ring of thirteen golden stars around a gold anchor. A blue ribbon that contains the word "Hope" is placed under the anchor. The gold anchor is a symbol of hope, and it also reflects the massive role that the ocean plays in the state's geography. The thirteen stars represent both the original thirteen colonies that made up the United States and the fact that Rhode Island was the thirteenth state to ratify the Constitution in the years following the American revolution. 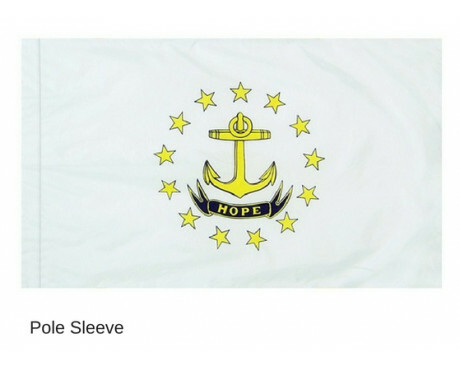 "Hope" is the state's motto, and it most likely began as a quotation from the Bible that reflected the early colonists' optimism about their future in America. 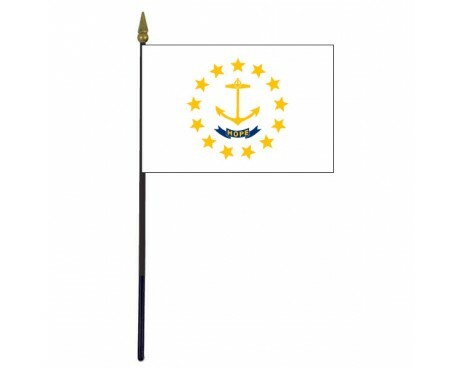 The first state flag of Rhode Island was adopted in 1887. It had a white field with a blue ring of stars surrounding a blue anchor inside a red shield with the word "Hope" written along the top of the shield. The anchor and the word "Hope" were taken from the state's seal, which dates back to the middle of the 17th century. The anchor and the white field were used on military flags from Rhode Island during the Revolutionary War and several later conflicts, but the flag was not authorized for civilian use until approximately one century after it was first carried into battle. 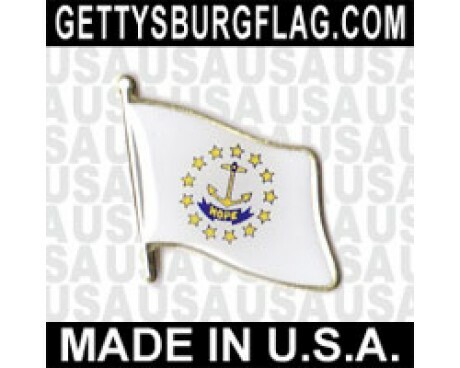 The first Rhode Island state flag was replaced in 1882. 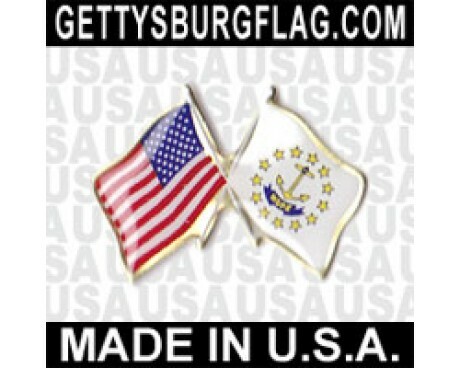 The replacement flag had a blue field and depicted the stars and anchor in gold. It was the only Rhode Island flag that did not include the state's motto. Rhode Island used the design until 1897, at which point it adopted the Rhode Island flag that has remained in use ever since that time. Rhode Island is the smallest of the states in the Union. The state was founded in 1636 by Roger Williams, after he had been exiled for religious dissent from the Massachusetts Bay Colony. In 1664 the first state seal appeared, which was comprised of an anchor, and the word "Hope". This word is always represented in heraldry by the anchor. These symbols appeared on the flag of the 2nd Rhode Island regiment, with 13 stars of the original states in the canton during the Revolutionary War. During the Civil War in accordance with common practice, the anchor and motto were used on a blue field. Since March 1877 a state flag had been in official use and consisted of a white field containing a blue anchor, with a red outline and surrounded by a circle of 38 stars. On February 1, 1882 a second design had a yellow anchor in a red outline, and a circle of 13 yellow stars, all of which had a blue field. A rope is wrapped around the anchor, but this was taken away in 1892 in a revised version. Five years later the current flag was officially adopted. In 1636, settlers came from Massachusetts in search of religious freedom. Rhode Island obtained a charter in 1663 as a Colony, and Providence Plantations. On May 4, 1776 the state-renounced allegiance to Britain and reluctantly joined the Union on May 29, 1790.